Silverman said this year’s online format was designed to be “more inviting and accessible to our readers.” Among the features: a Program Impact section, which offers highlights of key developments in each of the foundation’s grantmaking programs and Special Initiatives. The Leadership section describes ways “we have used Irvine’s voice to enhance the work we’re supporting through grants,” Silverman adds. The report also looks at Irvine’s financial and organizational health using a variety of quantitative measures. 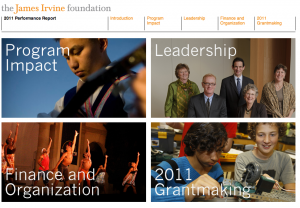 Silverman says Irvine’s online report “represents the latest evolution in our approach to reporting on our impact. In that sense, it is a work in progress.” Anyone with comments or suggestions for improvement is invited to email Silverman.